POSTED January 10, 2018 3:02 p.m. 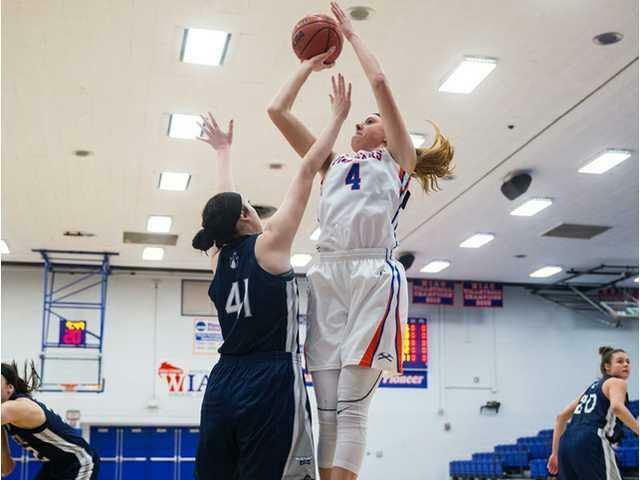 The duo of Allison Prestegaard and Lexis Macomber led UW–Platteville to a Wisconsin Intercollegiate Athletic Conference opening win Wednesday night inside Williams Fieldhouse as the two centers combined for 43 points in the Pioneers’ 83–75 win over UW-Stout. Prestegaard finished with career-highs in points and blocks with 27 and 10. She added 13 rebounds, six of them offensive to post just the second triple–double in program history. Lisa Wudden recorded the other at Edgewood on Dec. 29, 2007. Macomber collected a career-high 16 points and tied a career-high with seven rebounds. After trailing early in the first quarter UW–Platteville (5–8, 1–1) rebounded and took a 20–13 lead early in the second. UW–Stout (7–5, 0–1) was able to close the gap at the half as UWP took just a two-point lead into the second half. The Blue Devils’ full-court press gave the Pioneers trouble early in the third quarter and Stout converted it their opportunities as the home team fell behind by four just a minute into the third quarter, but the Pioneers responded quickly. UW-Platteville dominated the boards in the second half outrebounding UW–Stout 28–16, and Prestegaard shut down UW–Stout in the lane rejecting seven Blue Devil shots after the break. The hard-nosed play paid off as the Pioneers took a 77–68 lead with 1:23 left in the game. Clutch free-throw shooting in the final minute sealed a Pioneers’ victory in their WIAC opener. The Pioneers return to action tonight, playing host to WIAC co-leading UW–River Falls (11–2, 2–0 WIAC) at 7 p.m. The frigid weather that gripped much of the country last week seemed to catch up to the UW–Platteville women’s basketball team Saturday night, as the Pioneers fell 75–42 at UW–Eau Claire. The Pioneers, coming off a home win against Stout on Wednesday, couldn’t match that performance in Zorn Arena, connecting on just 28 percent of their shots. The Blugolds led 21–6 after one period and 40–15 at the half en route to the victory. UWEC improved to 10–3 overall and 2–0 in WIAC play, while the Pioneers fell to 5–8. 1–1. Miranda Meland scored nine points, and Kassie Hansen seven for the Pioneers. The Blugolds’ Hallee Hoepner led all scorers with 16 points. UW–Stout (7–5, 0–1) — Kyncaide Diedrich 23, Haley Seifert 7, Bailey Diersen 16, Anna Brown 7, Amber Fabeck 10, Becky Fesenmaier 2, Carsyn Osterman 5, Kara Griswold 3, Emily Jacques 2. Totals — 24-80 18-20 75. UW–Platteville (5–7, 1–0) — Allison Prestegaard 27, Blaire Lutes 10, Kassie Buchholz 10, Lexis Macomber 16, Maiah Domask 7, Rachel Emendorfer 5, Amber Williams 2, Kassie Hansen 6. Totals — 31-74 19-27 83. 3-point goals — S: 9 (Diedrich 3, Seifert 1, Diersen 1, Fabeck 2, Osterman 1, Griswold 1), P: . Team fouls — S: 20, P: 20. Fouled out — none. UW–Platteville (5–8, 1–1) — Allison Prestegaard 2, Blaire Lute 3, Maiah Domask 5, Kassie Buchholz 2, Lexis Macomber 4, Sydnei Smith 3, Rachel Emendorfer 5, Miranda Meland 9, Amber Williams 2, Kassie Hansen 7. Totals — 17-60 2-4 42. UW–Eau Claire (10–3, 2–0) — Maddie Dunathan 9, Kelsey Bakken 8, Halle Hoppner 16, Kayla Hanley 13, Janice Anderson 2, Jenni LaCroix 9, Brooke Harris 8, Elly Boles 4, Sarah Huebner 4, Jordanna Midthun 2. Totals — 30-72 7-8 75. 3-point goals — P: 6 (Lutes 1, Domask 1, Smith 1, Emendorfer 1, Meland 2), EC: 8 (Dunathan 2, Hoeppner 2, Hanley 3, La Croiz 1) . Team fouls — P: 7, EC: 13. Fouled out — none.